In honor of Chancellor Randolph Bromery, the Departments of Afro-American Studies and Geosciences present a dinner-panel titled “Black Studies, Geosciences, and the Global Quest for Environmental Justice.” The event aims to encourage interdisciplinary collaboration, reflect on Dr. Bromery’s legacy of championing diversity within STEM fields, and provide perspectives from diverse academic fields to help us understand the urgency of considering Environmental Justice as central to both Geosciences and Black Studies. 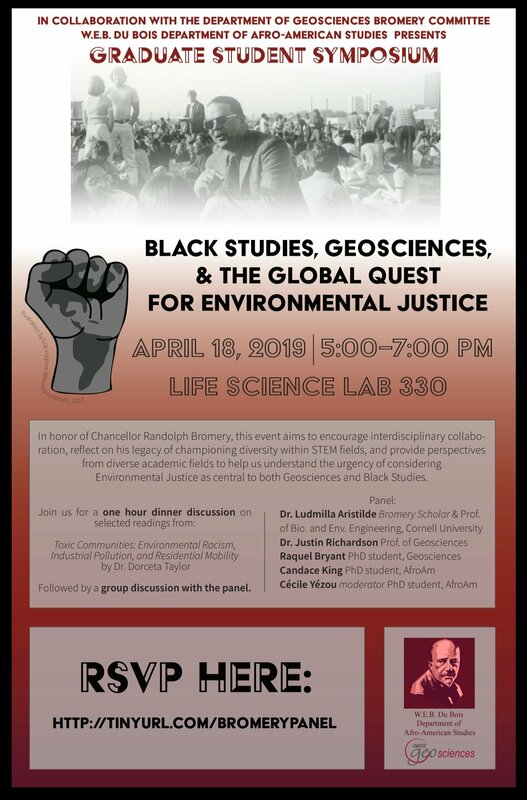 The event will consist of one hour of small group discussion over dinner, facilitated by one of our panelists and centered around selected readings from Toxic Communities: Environmental Racism, Industrial Pollution, and Residential Mobility by Dr. Dorceta Taylor (e-book available through UMass Library). The second hour will be a whole group discussion with Q & A for the panel.